Despite the deceptive name, a stormceptor is not a Transformer or similarly awesome robot. 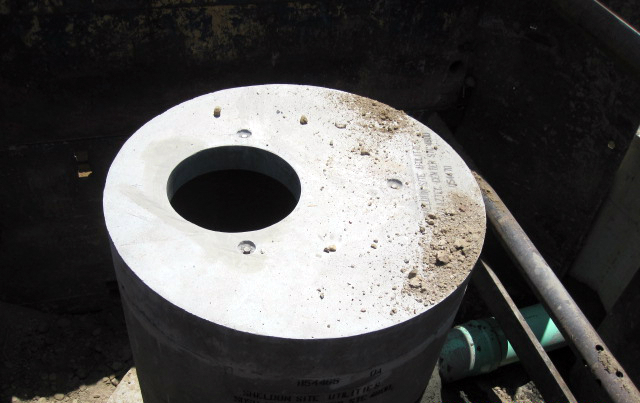 It’s actually a device that helps keep storm drains clean, which in turn keeps oceans cleaner, too. In San Diego, rain comes mostly during winter (although a summer shower isn’t unheard of, just unlikely). Once raindrops hit the pavement, all the dust, debris and other stuff that collects the other 350-odd dry days of the year gets washed into storm drains and water ways. Unfortunately, debris can then block portions of storm drains, creating overflow and possible flooding. That is, unless a stormceptor is installed. See that hole on the side? That strategically placed hole allows the stormceptor tank to filter out sediment and other debris. So, water flows into the stormceptor (see below), sediment settles to the bottom, and, when it fills up enough, the overflowing water makes its way onto its next destination, usually a nearby storm drain. 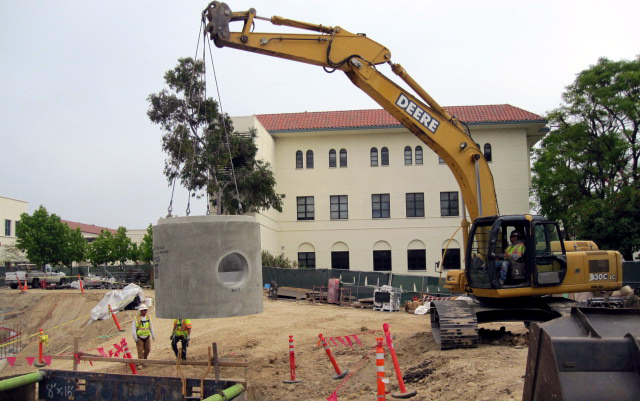 Only, in the case of Aztec Student Union, that water will actually collect in our underground rain water harvest tanks. That collected rain water will be used for things like landscape irrigation, reducing our reliance on piped water and the burden on the city-owned storm sewer system. 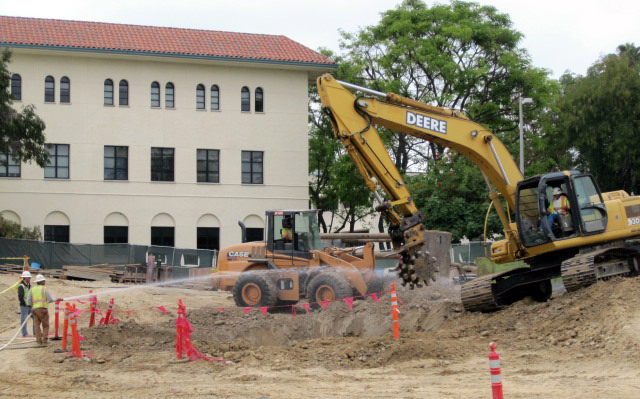 So, the next time it rains, think of the unseen stormceptor buried beneath your feet (here’s our goodbye to the Aztec Student Union stormceptor as the project crew fills in the hole with dirt — the water sprayed is keeping dust and sediment from reaching the air filters of our neighbors in Student Services). Just another way Associated Students is keepin’ Aztec Student Union green (and LEED platinum-certified)! 1 Response to Stormceptor, Go!